The Battle of Kunersdorf, by Alexander Kotzebue, 1848. Great Britain and Spain gained New France. Prussian control over most of Silesia was confirmed. The Seven Years War (1756-1763) involved all the major European powers of the period, causing 900,000 to 1,400,000 deaths. It enveloped both European and colonial theatres from 1756 to 1763, incorporating the Pomeranian War and the French and Indian War which was fought from 1754 to 1763. Prussia, Hanover, and Great Britain (including British colonies in North America, the British East India Company and Ireland) were pitted against Austria, France (including the North American colony of New France and the French East India Company), the Russian Empire, Sweden, and Saxony. Portugal (on the side of Great Britain) and Spain (on the side of France) were later drawn into the conflict, and a force from the neutral Netherlands was attacked in India. The war ended France's position as a major colonial power in the Americas (where it lost all of its possessions except French Guiana, Guadeloupe, Martinique, Saint-Domingue, and Saint Pierre and Miquelon) and its position as the leading power in Europe, until the time of the French Revolution. Great Britain, meanwhile, emerged as the dominant colonial power in the world. The French Navy was crippled, which meant that only an ambitious rebuilding program in combination with the Spanish fleet would see it again threaten the Royal Navy's command of the sea. On the other side of the world, the British East India Company acquired the strongest position within India, which was to become the "jewel in the imperial crown." The war was described by Winston Churchill as the first "world war," as it was the first conflict in human history to be fought around the globe, although most of the combatants were either European nations or their overseas colonies. As a partially Anglo-French conflict involving developing empires, the war was one of the most significant phases of the eighteenth century Second Hundred Years' War. British victories had a far reaching impact. They meant North America and India developed into English-speaking liberal democracies. In Canada and the United Kingdom, the Seven Years War is used to describe the North American conflict as well as the European and Asian conflicts. In French Canada, however, the term War of the Conquest is commonly used. The conflict in India is termed the Third Carnatic War while the fighting between Prussia and Austria is called the Third Silesian War. While some United States-based historians refer to the conflict as the Seven Years War regardless of the theatre involved (such as Fred Anderson in A People's Army: Massachusetts Soldiers & Society in the Seven Year's War), others and non-scholars often use that term to refer only to the European portions of the conflict (1756–1763), not the nine-year North American conflict or the Indian campaigns which lasted 15 years (including Pontiac's Rebellion), which are known as the French and Indian War. The name French and Indian War is so given because the British fought the French and many of the Native Americans (also known as "Indians") sided with France, although some did fight alongside the British. The Seven Years War may be viewed as a continuation of the War of the Austrian Succession, in which King Frederick II of Prussia had gained the rich province of Silesia. Empress Maria Theresa of Austria had signed the Treaty of Aix-la-Chapelle (1748) only in order to gain time to rebuild her military forces and to forge new alliances, which she did with remarkable success. The political map of Europe had been redrawn in a few years. During the so-called Diplomatic Revolution of 1756, century-old enemies France, Austria and Russia formed a single alliance against Prussia. Prussia had the protection only of Great Britain, whose ruling dynasty saw its ancestral Hanoverian possession as being threatened by France. In Great Britain's alliance with Prussia the two powers complemented each other. The British already had the most formidable navy in Europe, while Prussia had the most formidable land force on continental Europe, allowing Great Britain to focus its soldiers towards its colonies. The Austrian army had undergone an overhaul according to the Prussian system. Maria Theresa, whose knowledge of military affairs shamed many of her generals, had pressed relentlessly for reform. Her interest in the welfare of the soldiers had gained her their undivided respect. The second cause for war arose from the heated colonial struggle between Great Britain and France. Until the war, neither the French, nor the British had claimed the area along the Ohio River in North America. This area was fertile, rich for farming and trading, and would later become part of the American breadbasket region of the Midwest. The primary reason for the beginning of the American theatre of the war was a dispute over the Ohio River banks. Unlike the prior three wars of colonial possession between France and the British, this one began in the Americas and spread to Europe secondarily. To the British Colonials, the war lasted slightly over nine years. Robert Dinwiddie, the governor of Virginia, was in a predicament. He had several wealthy friends that had business interests in the area claimed by the French. If the French gained control of the Ohio Country, Dinwiddie's friends would stand to lose large sums of money. He had to act and do so quickly. Therefore, on October 31, 1753 newly minted Major George Washington of the Virginia Militia was dispatched, along with his interpreter Jacob Van Braam to deliver a letter to the French commander in the Ohio Country, Jaques Legardeur de Saint-Pierre. The letter insisted upon immediate French withdrawal from the Ohio Country. On November 12, 1753, Major George Washington arrived at Fort Le Boeuf. He dined with Jaques Legardeur de Saint-Pierre on the evening of the twelfth. When he presented the French commander with his letter, Saint-Pierre's response was quite diplomatic, "As to the Summons you send me to retire, I do not think myself obliged to obey it" (Fowler 2005, 35). As Washington was meeting with Saint-Pierre, Governor Robert Dinwiddie sent a force of 50 men under Captain William Trent to seize and fortify the forks of the Allegheny River where it connected to the Ohio River. The expedition, however, did not reach the area until February 1754, at which point Fort Trent was constructed by the British. Fort Trent was attacked by the French forces in the area, under the command of Claude-Pierre Pecaudy de Contrecoeur, on April 16, 1754. The British surrendered the same day. With the failure of William Trent's expedition and the refusal of the French to leave the Ohio Country, Robert Dinwiddie upped the ante by sending Washington, now promoted to Lieutenant Colonel, on another mission to the Ohio Country with an advanced force and the British Colonials ambushed a French-Canadian scouting party. After a short skirmish (Battle of Jumonville Glen), virtually all the French force perished or were initially captured. Washington's Native American ally Tanacharison brutally killed the wounded French commander, Ensign Jumonville, by tomahawk. That eventually became widely known as the notorious "Jumonville affair", an international incident that eventually helped to ignite the Seven Years War on the European Continent and around the world. In 1755, General Braddock rehabilitated Washington and took him on as an aide and launched a large force into the wilderness intending to take the forks of the Ohio (present-day Pittsburgh). The French and Indian allies attacked from the sides of the road being hacked by Braddock's men the force in the Battle of the Monongahela, during which Washington showed great poise and extracted the British force in a skillful retreat after Braddock fell to wounds. This made Washington an international name, and he was toasted as the Hero of the Monongahela for years to come. The war erupted in earnest in Europe as well on May 15, 1756, when the Diplomatic Revolution had been finalized and Great Britain declared war on France. In accordance with history doctrines, King Frederick determined to strike first. On August 29, his well-prepared army crossed the frontier of Saxony. In the European theater, Prussia was outnumbered, but not outclassed, by her opponents. Prussia was a small state, but as Voltaire once remarked: "Where some states possess an army, the Prussian Army possesses a state!" At the start of the war, Frederick crossed the border of Saxony, one of the smaller German States in league with Austria. The Saxon and Austrian armies were unprepared, and at the Battle of Lobositz Frederick prevented the isolated Saxon army from being reinforced by an Austrian army under General von Browne. However, Saxony had successfully delayed the Prussian campaign. In the Mediterranean, the French opened the campaign against the British by an attack on Minorca; a British attempt at relief was foiled at the Battle of Minorca and the island was captured (for which Admiral Byng was court-martialed and executed). In the spring of 1757, Frederick again took the initiative by marching on Prague. After the bloody Battle of Prague the Prussians started to besiege the city, but had to lift the siege after Frederick's first defeat at the Battle of Kolin. In summer, the Russians invaded East Prussia, and defeated a smaller Prussian force in the fiercely contested Battle of Gross-Jägersdorf. Things were looking very grim for Prussia at this time, with the Austrians mobilizing to attack Prussian-controlled soil and a French army under Soubise approaching from the west. In what Napoleon would call "a masterpiece in maneuver and resolution," Frederick thoroughly crushed both the French at the Battle of Rossbach and the Austrians at the Battle of Leuthen. With these complete victories at hand, Frederick had once again established himself as Europe's finest general and his men as Europe's finest soldiers. The British planned a "descent" (an amphibious demonstration or raid) on Rochefort, a combined Army-Navy operation to overrun the town and burn the shipping in the Charente. The expedition set out on September 8, 1757, Sir John Mordaunt commanding the troops and Sir Edward Hawke the fleet. On September 23, the Isle d'Aix was taken, but due to dithering by the military staff such time was lost that Rochefort became unassailable, and the expedition abandoned the Isle d'Aix and returned to Great Britain on October 1. Despite the operational failure and debated strategic success of the descent on Rochefort, Pitt — who saw purpose in this type of asymmetric enterprise — prepared to continue such operations. An army was assembled under the command of the Charles Spencer, 3rd Duke of Marlborough; he was aided by Lord George Sackville. The naval escorts for the expedition were commanded by Anson, Hawke, and Howe. The army landed on June 5, 1758 at Cancalle Bay, proceeded to St. Malo, and burned the shipping in the harbor; the arrival of French relief forces caused the British to avoid a siege, and the troops re-embarked. An attack on Havre de Grace was called off, and the fleet sailed on to Cherbourg; but the weather being bad and provisions low, that too was abandoned, and the expedition returned, having damaged French privateering and provided a further strategic demonstration against the French coast. Pitt now prepared at last to send troops into Germany; and both Marlborough and Sackville, disgusted by the futility of the "descents," obtained commissions in that army. The elderly General Bligh was appointed to command a new "descent," escorted by Howe. The campaign began propitiously: with the support of the navy to bombard Cherbourg and cover their landing, the army drove off the French force detailed to oppose their landing, captured Cherbourg, and destroyed its fortifications, docks, and shipping. Re-embarking, the troops were landed on September 3 at the Bay of St. Lunaire in Brittany, with the idea of acting against St. Malo, but this proved impractical. Worsening weather forced the two arms to separate: the ships sailed for the safer anchorage of St. Cast, while the army proceeded overland. The tardiness of Bligh allowed a French force of 10,000 men from Brest to catch up with him and open fire on his embarkation. They were held off by the rear-guard of 1,400 under General Drury while the rest of the army embarked; but they could not be saved, and 750, including Drury, were killed and the rest captured. Frederick invaded Austria in the spring of 1758 and failed to score an important victory. In the west, the French were beaten in the Battle of Rheinberg and the Battle of Krefeld by Prince Ferdinand of Brunswick. In the east, at the Battle of Zorndorf in Prussia, a Prussian army of 35,000 men under Frederick fought to a standstill with a Russian army of 43,000 commanded by Count Fermor. The Russians withdrew from the field. In the undecided Battle of Tornow on September 25, a Swedish army repulsed six assaults by a Prussian army. On October 14, the Austrians surprised the main Prussian army at the Battle of Hochkirch. Frederick lost much of his artillery but retreated in good order. 1759 saw some severe Prussian defeats. 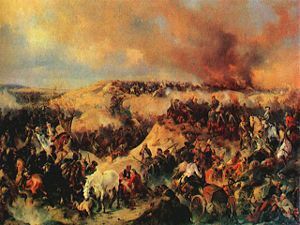 At the Battle of Kay, or Paltzig, the Russian Count Saltykov with 70,000 Russians defeated 26,000 Prussian troops commanded by General von Wedel. Though the Hanoverians defeated an army of 60,000 French at Minden, Austrian general Daun forced the surrender of an entire Prussian corps of 13,000 men in the Battle of Maxen. Frederick himself lost half his army in the Battle of Kunersdorf, the worst defeat in his military career which drove him to the brink of abdication and suicide. The disaster resulted partly from his misjudgment of the Russians, who had already demonstrated their strength at Zorndorf and at Gross-Jagersdorf. The French planned to invade the British Isles during 1759 by accumulating troops near the mouth of the Loire and concentrating their Brest and Toulon fleets. However, two sea defeats prevented this. In August, the Mediterranean fleet under M. de la Clue was scattered by a larger British fleet under Edward Boscawen at the Battle of Lagos. In the Battle of Quiberon Bay on November 20, the British admiral Edward Hawke with 23 ships of the line caught the French Brest fleet with 21 ships of the line under Marshal de Conflans and sank, captured or forced aground many of them, putting an end to the French plans. The year 1760 brought even more disaster to the Prussians. The Prussian general Fouqué was defeated in the Battle of Landshut. The French captured Marburg, and the Swedes part of Pomerania. The Hanoverians were victorious over the French at the Battle of Marburg, but the Austrians, under the command of General Charles Flynn captured Glatz in Silesia. In the Battle of Liegnitz Frederick scored a victory despite being outnumbered three to one. The Russians under General Saltykov and Austrians under General Lacy briefly occupied his capital, Berlin. The end of the year saw Frederick once more victorious in the Battle of Torgau. In 1761 a new country was brought into the war. Spain declared war on Great Britain on January 4. In the Battle of Villinghausen Prince Ferdinand of Brunswick defeated a 92,000 man French army. The Russians under Zakhar Chernyshev and Pyotr Rumyantsev stormed Kolberg in Pomerania, while the Austrians captured Schweidnitz. Great Britain now threatened to withdraw her subsidies, and, as the Prussian armies had dwindled to 60,000 men, Frederick's survival was severely threatened. Then on January 5, 1762 the Tsaritsa died, and her Prussophile successor, Peter III, at once recalled Russian armies from Berlin and mediated Frederick's truce with Sweden. In the aftermath, Frederick was able to drive the Austrians from Silesia in the Battle of Freiberg (October 29, 1762), while his Brunswick allies captured the key town of Göttingen. Battles occurred in India, North America, Europe, the Caribbean isles, the Philippines and coastal Africa. During the 1750s up to 1763, Great Britain gained enormous areas of land and influence at the expense of the French. In India Robert Clive, defeated the French and their Indian allies, leaving the British East India Company in control of Bengal and a major military and political power in India. In 1758, the British mounted an attack on New France by land and by sea. The French fortress at Louisbourg on Cape Breton Island fell in 1758. And on September 13 1759, General James Wolfe defeated the French forces at Québec. By the autumn of 1760, French America had become British. Great Britain lost Minorca in the Mediterranean to the French in 1756 but captured the French colonies in Senegal on the African continent in 1758. The Royal Navy captured the French sugar colonies of Guadeloupe in 1759 and Martinique in 1762, as well as the Spanish cities of Havana in Cuba and Manila in the Philippines. Towards the very end of the war, in 1762, French forces attacked St. John's, Newfoundland. If successful, the expedition would have strengthened France's hand at the negotiating table. Though they took St. John's and raided nearby settlements, the French forces were eventually defeated by British troops in the Battle of Signal Hill. The battle was the final battle of the war in North America and forced the French to surrender St. John's to the British under the command of Col. William Amherst. The war ended with the Treaty of Paris, signed in 1763. It included the cession to Great Britain of all New France except for the islands of St. Pierre and Miquelon. The British-French hostilities were ended in 1763 by the Treaty of Paris, which involved a complex series of land exchanges. France was given the choice of keeping either New France or its Caribbean island colony Guadeloupe, and chose the latter to retain one of its sources of sugar. This suited the British as well, as their own Caribbean Islands already supplied ample sugar, but with the handover of New France they gained control of all lands in North America east of the Mississippi River with the exception of New Orleans. However, the end of the threat from New France to the British American colonies and the subsequent reorganization of those colonies would later become one of the enabling triggers for the American Revolution. Spain lost control of Florida to Great Britain, but received New Orleans and the Louisiana Territory west of the Mississippi River from the French. France also returned Minorca to the British. European boundaries were returned to their pre-war states, by the Treaty of Hubertusburg (February 1763). This meant that Prussia was confirmed in its possession of Silesia. Prussia had survived the combined assault of its numerous neighbors, each larger than itself. According to some historians, Prussia gained enormously in influence at the cost of the Holy Roman Empire. This influence marks the beginning of the modern German state, an event at least as influential as the colonial empire Great Britain had gained. Others, including Fred Anderson, author of "Crucible of War," disagree. According to Anderson, "Beyond the inevitable adjustments in the way diplomats would think of Prussia as a player in European politics, six years of heroic expenditure and savage bloodshed had accomplished precisely nothing." From a military point of view, the battles are less interesting than the numerous marches and countermarches in which Frederick excelled. This warfare of mobility would later be admired by Napoleon Bonaparte. In fact, the Seven Years War was the last major military conflict in Europe before the outbreak of the Revolutionary and Napoleonic Wars towards the end of the eighteenth century. ↑ Statistics of Wars, Oppressions and Atrocities of the Eighteenth Century Seven Years War (1755-1763), Matthew White. Retrieved May 20, 2008. Bowen, H. V. War and British Society 1688-1815. Cambridge, United Kingdom: Cambridge University Press, 1998. ISBN 0521576458. Corbett, Julian. 1918, England in the Seven Years' War: A Study in Combined Strategy Vol. II., Second Edition (in English), London: Longman, Green and Co.
All links retrieved September 9, 2015. History of "Seven Years War"
This page was last modified on 9 September 2015, at 15:36.